Antibodies are molecules produced by a human’s immune system to counteract bacteria and viruses. When a bacterial or viral pathogenic molecule (a so-called antigen) is detected, an antibody neutralizes it by binding to it. However, autoantibodies are sometimes produced against our own protein and cause autoimmune diseases. For the autoantibody known as ANCA (antineutrophil cytoplasmic antibody) cause ANCA-associated vasculitis (AAV), at least two antigens exist: proteinase 3 and myeloperoxidase (abbreviated as PR3 and MPO, respectively). Characteristics of patients involved in the MPO-ANCA biomarker study. Assistant Professor Haruki Watanabe and Associate Professor Ken-Ei Sada from Okayama University and colleagues have now investigated whether MPO-ANCA can be used as a biomarker for the relapse of AAV, a blood-vessel inflammation disease. The researchers’ findings suggest that monitoring MPO-ANCA is useful for predicting relapse in patients with AAV. The scientists looked at data for 271 MPO-ANCA-positive patients who had achieved remission (disappearance of the signs and symptoms) of AAV during 6 months after therapy was started. Levels of MPO-ANCA were measured at several times in a 2-year period. Assistant Professor Haruki Watanabe and Associate Professor Ken-Ei Sada from Okayama University and colleagues found that for 72% of the patients, MPO-ANCA levels decreased to normal within 6 months after therapy began. MPO-ANCA reappeared for 40% of the patients for which there were complete follow-up data; this reappearance was associated with a relapse occurring simultaneously or later. The researchers therefore concluded that reappearance of MPO-ANCA is a promising marker for AAV relapse. Assistant Professor Haruki Watanabe and Associate Professor Ken-Ei Sada from Okayama University and colleagues found indications that MPO-ANCA reappearance could be particularly useful as a biomarker for relapse of AAV with kidney involvement (renal AAV). 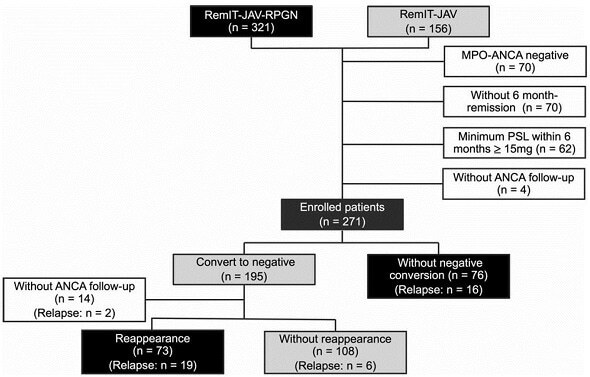 Since only 4 patients without renal involvement experienced relapse, a larger study would be necessary to establish any link between MPO-ANCA reappearance and relapse of non-renal AAV. The researchers point out that their study has some limitations: the data were obtained earlier, in the context of other investigations, and different participating institutions used different analytic procedures for qualitatively assessing ANCA content. Nevertheless, the study was the largest so far, and also the first with case–control analysis (based on comparisons of patients with and without the disease relapse). Watanabe and colleagues conclude that for patients recovered from MPO-AAV, “routine MPO-ANCA monitoring should be implemented [to predict possible relapse]”. Antineutrophil cytoplasmic antibody-associated vasculitis (AAV) refers to a set of diseases (granulomatosis with polyangiitis, eosinophilic granulomatosis with polyangiitis and microscopic polyangiitis), the characteristics of which are destruction and inflammation of small blood vessels. Clinical signs vary, and different organs can be affected, including kidneys, stomach, and lungs. A study by Assistant Professor Haruki Watanabe and Associate Professor Ken-Ei Sada from Okayama University and colleagues has now shown that for patients having had AAV, monitoring the presence of an antigen known as MPO-ANCA should help to predict AAV relapse.